Growing herbs indoors was once my way of coping with “city life” when I actually wanted to be outside…on a farm with a flourishing garden and some goats. Not only can an indoor herb garden brighten up your living space (and add the living element you’re seeking if you have #farmwife goals like me), it can also make nearly every meal you prepare way better. Herbs also come with health benefits, as they’re loaded with vitamins and many have antibacterial and antiviral properties. Plus, growing your own means ditching the plastic bags and ties that come with store-bought herbs (along with the fuel it took to get them there). And perhaps the best part of all is that you don’t need a green thumb! If you have light coming into your home, you can grow herbs. The ten herbs outlined below do well in a variety of conditions, from low light to full sun (and in mint’s case, whatever you want because that sh*t will grow anywhere and everywhere). You could grow all of these from seeds with the exception of lemon balm and chives (both of which are slow AF). But for a faster harvest on any herb, purchase them already started – in the little planter already flourishing and ready to be transplanted – at the farmer’s market or your local nursery. Of course, channeling your inner 3rd grade science student and watching the sprouts emerge from the dirt is cool, too. Make lemon balm tea by placing 2 tablespoons of fresh leaves in a cup of boiling water. Similarly, make iced tea by putting the leaves in a jar of water with a slice of lemon, and leave it in the fridge for a few hours or overnight. Lemon balm is also great chopped up and added to salads (especially fruit salads). A well-known feature of lemon balm is its mild sedative effect that can be useful for anxiety and insomnia. Lemon balm is also helpful for digestive woes (like upset stomach, wind, bloating, vomiting, and colic), in addition to pain from headaches or menstrual cramps. It has also been shown to enhance mood and cognitive performance in a study involving young adults. Lastly, research is showing that it could have antioxidant and anti-inflammatory properties. Chives are an everything topper. Just trim off the top and add them to salads, pasta, and more. And while we may eat them in small amounts, they’re a source of vitamins A, C, and K, folate, calcium, magnesium, phosphorous, and potassium. Similar to chives (but not the same) are green onions – buy a bunch with roots from the store and place them in soil. Add mint leaves to yerba mate (hot or cold) and serve with a slice of lemon. Alternatively, make mint-infused lemon water by leaving it in the fridge for a few hours or overnight. Mint is also an essential ingredient for mojitos! And when it comes to food, mint is practically a summer roll staple, in my opinion. This herb is known for its calming and soothing effect that’s great for upset stomachs and indigestion. Parsley is used in a wide variety of dishes, but it’s also a refreshing addition to green smoothies. Similar to chives, use it as a topper for most everything. Parsley has a high vitamin K content with 77% of your daily value in a tablespoon. If you’re on blood thinners, this is an herb you should steer clear of because of vitamin K’s blood clotting properties. Basil is one of my favorite salad add-ins. All you need is a leaf or two for an uplifting twist in a summer salad. There’s a lot of varieties of basil - sweet basil is the most common and my top choice for adding to salads, but Thai basil can add another level to your favorite Thai dish. One of my favorite varieties of basil is holy basil (also called tulsi), which can be used to make into tea. This ayurvedic herb is known as “The Incomparable One,” “Mother Medicine of Nature,” and “The Queen of Herbs,” and for good reason, too. Tulsi has been revealed to have a number of actions like antimicrobial, anti-inflammatory, and memory enhancement, but most people know it for its role as an adaptogen. Adaptogens help the body maintain balance in the presence of stressors. Easy to grow but short-lived, so don’t be too sad if it dies off – plant it again! Like chives and parsley, cilantro is used in so many dishes (hello, guacamole!) and a great all-around topper. It also gives a summery twist to smoothies. Like parsley, cilantro is also high in vitamin K with 16% of your daily value in a quarter cup. My favorite ways to use ginger are sautéed in a stir fry or steeped in lemon-ginger tea. And yet again, ginger is a smoothie addition you should try. The main bioactive compound in ginger is called gingerol, which is responsible for much of its medicinal properties. Aside from its common use in treating nausea and upset stomachs, it’s also a powerful antioxidant and anti-inflammatory, the latter of which could help with osteoarthritis. Rosemary roasted potatoes are the simple side dish that make you look like a chef. You can get a little fancier (though still remarkably easy) and make rosemary vinegar, rosemary-infused olive oil, or rosemary-lemon sea salt. You can also have rosemary as a tea by steeping a sprig in hot water. This makes a savory tea, but you can add honey if you prefer it sweet. 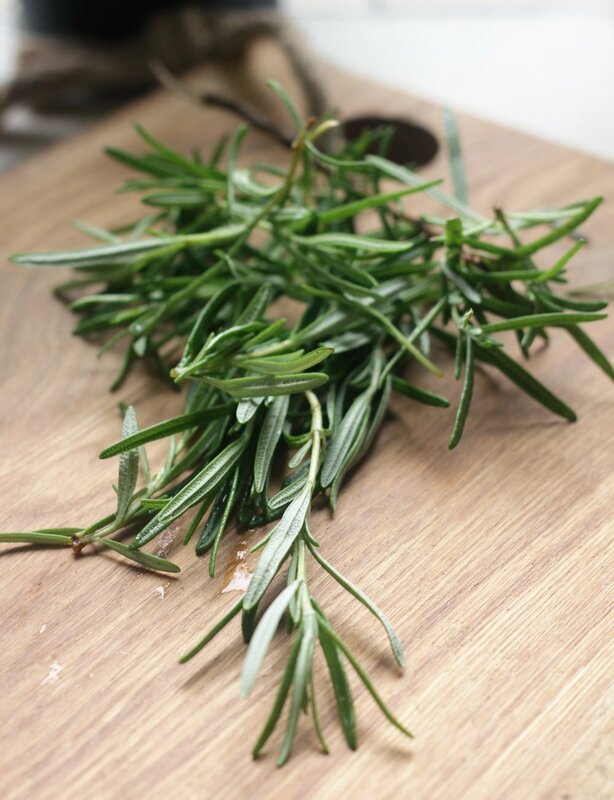 Rosemary is particularly useful for digestive ailments – it is protective against bacterial infections, particularly infections in the stomach related to h. Pylori, and can also help soothe an upset stomach. The easiest way to use sage is to dry it first by hanging bundles out of direct sunlight. Once it’s dry, you can chop it up or pulse it in a blender to use for tea, cooking, and baking (like these pumpkin sage biscuits). As with many of the other herbs, sage is used for digestive problems, such as a loss of appetite, wind, stomach pain, diarrhea, bloating, and heartburn. It also has cognitive benefits related to depression and memory loss. And for the ladies, sage can relieve painful periods and reduce hot flashes. Dill is an herb that doesn’t get enough attention – it’s not just for pickles anymore. Add it to your rosemary potatoes or even scrambled eggs. Also, a creamy tomato soup isn’t really complete without some fresh dill in my world. An ounce of dill has 43% of your daily value of Vitamin A and 40% of vitamin C. It also carries a decent dose of folate at 11% of your daily value. Deficiencies in these vitamins are pretty rare in the United States because of their abundance in many different foods along with fortification (for folate, you’ll see “folic acid” on the nutrition label), but folate in particular is super important for women who may become pregnant because of its protection against the development of neural tube defects and birth defects.